Recently, my pastor was preaching about the long dry periods we sometimes experience in our spiritual lives. He, of course, mentioned the 'dark night of the soul", a common reference for this subject and referred to by a few of the more famous in the Christian world who have experienced it, such as Mother Theresa. As he spoke (you can hear what he had to say here ) I could not help but think about the life of John de Yepes, the Christian mystic and poet who coined the phrase. Let me tell you a little about him. The de Yepes family was not a wealthy Spanish family. They might have been except that John's father Gonzalo had chosen to marry the common woman he loved, Catalina, instead of someone his noble father might have chosen for him. As a result he was disinherited and the young couple found themselves struggling to survive as silk weavers. Gonzalo passed away soon after John was born in 1542, leaving Catalina to struggle even harder to raise her boys. In an effort to find work she moved to Medina de Campo. Though John studied well at the "poor school" he attended, when he was apprenticed out to a local artisan, it seemed he was incapable of learning anything. Exasperated, his master loaned him out to a Jesuit school where John divided his time between his studies and serving in the hospital for the impoverished. Over the next seven years John felt the call of God grow ever stronger upon him, but not just any call. John was convinced that he was to become a friar in the strictest traditions of the old desert fathers. John felt that 'modern' orders had grown soft allowing themselves far too many of life's pleasures - like shoes. No... I'm not kidding! John joined the Carmelite order in 1563 taking the name John of St. Mathias. The order had historically been very strict, taking their example from the prophet Elijah. John felt that by embracing poverty and going without food, he would grow closer to God. But he soon decided the Carmelites were not strict enough and made the decision to transfer his allegiance to the Carthusians. Then he met Teresa of Avila. Like John himself, Teresa felt the order had grown far too soft; however, instead of leaving she was urging Carmelites to return to the original strict poverty of their order. John embraced Teresa's plan, and along with two other men, he moved into a farmhouse which was in such bad shape that even Teresa did not think anyone could live in it. He renamed himself John of the Cross and became the spiritual leader of the new movement. As a symbol of the strictness of their devotion they adopted the "discalced" discipline (from the Latin for without shoes). This discipline requires it's followers to go unshod, that is barefoot, as a testament to their devotion. The practice was introduced by Francis of Assisi when shoes were considered a luxury item. The followers of the discipline, devoted to a life of poverty either eschewed shoes entirely or limited themselves to simple sandals when conditions warranted - such as in winter. Sometime later, Teresa invited John to come to Avila and serve as director and confessor to the convent of the Incarnation, of which she had been appointed prioress. During the five years he remained there the reform spread rapidly, and soon those in higher authority began to take a great deal of notice. Because the movement did not have the official sanction of the powers that be, John was ordered to return to the house of his profession, that is the monastery on Medina. He refused to do so, and soon found himself in prison for resisting commands from a superior. In prison, he was scourged. But after nine months, he managed to escape and reappeared as leader of another community at Ubeda. He spent the rest of his life there, passing away on December 14, 1591. While in prison, John began writing "Dark Night of the Soul", a commentary on a poem he had written. The poem, called "The Ascent of Mount Carmel" (where Elijah met the priests of Baal) was extensive, originally intended to take up four books; but it breaks off part way through the third. In it and his other writings he sets forth the axiom that the soul must empty itself of self in order to be filled with God, that it must be purified of the last traces of earthly dross before it is fit to become united with God. In the application of this simple maxim he shows the most uncompromising logic. For this reason St. John is often portrayed as a fairly grim character; but personally I've never thought that to be true. He was indeed austere in the extreme, but from his writings I see in him a man overflowing with charity and kindness, a poet deeply influenced by all that is beautiful in God's creation. 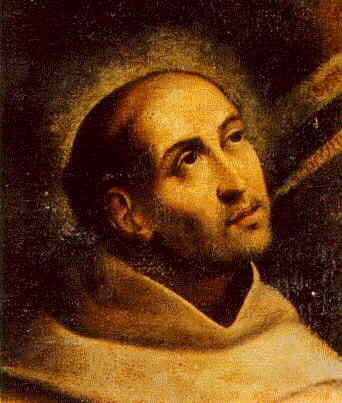 John of the Cross moved into that dilapidated farm house, giving birth to the Discalced Carmelite Order on November 28th, 1568 - 439 years ago this week. November 26, 1862: President Abraham Lincoln meets Harriet Beecher Stowe, the abolitionist author of Uncle Tom's Cabin and daughter of prominent minister Lyman Beecher. "So," Lincoln said upon meeting her, "you're the little woman that wrote the book that made this great war!" November 27, 1095: In an effort to end hostilities between waring factions within the church by giving them a common enemy, Pope Urban II addresses the public to proclaim the First Crusade. The goals were to defend Eastern Christians from Muslim aggression, make pilgrimages to Jerusalem safer, and recapture the Holy Sepulcher. "God wills it! God wills it!" the crowd shouted in response. November 29, 1847: Missionary physician Marcus Whitman, his wife, and 12 others are killed by Cayuse Indians in Washington's Walla Walla valley. Whitman had recently returned from a 3,000-mile journey to convince the American Board of Commissioners for Foreign Missions not to close down one of his three mission stations. He was successful, and returned with a fresh group of immigrants—and the measles virus. Many Cayuse died of the disease, some of them because Whitman gave them vaccinations. Two years after the massacre, five Cayuse elders voluntarily gave themselves up, in order to end further retribution against their tribe. Their leader, Tiloukaikt, said on the gallows, "Did not your missionaries teach us that Christ died to save his people? So we die to save our people." December 2, 1980: Three American nuns and a lay churchwoman are killed by death squads in El Salvador. Some 70,000 Salvadorans are estimated to have died because of terrorists or civil war during the 1980s, including many Catholic clergy.